It's been quite a while since I read a book that plunged me into the depths of desperate obsession; of hours of internet research and buying obscure documentaries on the subject; of having no wish in the world except to know every tiny detail of the subject. This was one of those books. Queen Victoria's Mysterious Daughter is gripping, spell-binding, magnificent. Princess Louise is fascinating; to use Victorian slang she would have understood in her day, she was a bricky basket of oranges, quite a proper bit of frock, and the absolute jammiest bit of jam. Little has been known in the past about Louise, Queen Victoria's sixth child and fourth daughter, or her remarkable long life in the years between 1848 and 1939. Intriguingly, and in contrast to all her other siblings, Louise's files in the Royal Archives are locked, and many other sources about her are closed to scholars. 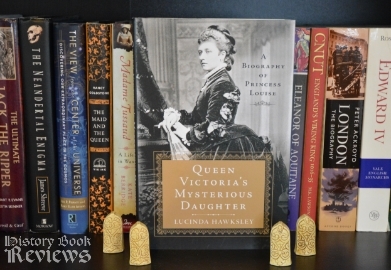 In Queen Victoria's Mysterious Daughter, Lucinda Hawksley acts as a historical detective, as well as a skilled biographer, to discover what Louise's life was really like and what scandals she may have been involved with that would warrant a lock-down of her historical files to this day. And what she finds will not disappoint. Right away I have to say, the beginning of this book is almost more about Queen Victoria than it is about Louise. I have been trying recently to find out why I have feelings of loathing and disdain for Victoria, and to see her in a more positive light...but this book did NOT help me in that regard. Hawksley may even dislike Victoria as much as I do! Victoria's policies and thoughts are documented thoroughly with her own diaries and letters, and show how she detested and fought against the Women's Rights movement, how she resented her children because they kept her from being alone with her husband Albert, and how she wanted to Germanise England as a tribute to Albert after he died. In case that isn't bad enough, she kept her children from having friends because seeing them happy and laughing infuriated her after Albert's death, she never gave special care to her hemophiliac son Leopold, nearly causing his death on many occasions with her thoughtlessness, and she considered her babies to be "physically repulsive" and "froglike". Wow. And I thought I was no fan of babies! Despite my own low level of maternal instinct, I found myself desperately wanting to go back in time and just hold Victoria's children, giving them some much-needed love. Sad as this part of the book is, it really sets up Louise's character and early life by showing the environment she grew up in. 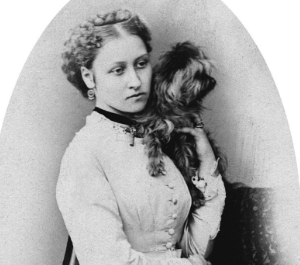 Princess Louise with one of her beloved dogs. Despite this atrocious upbringing, Princess Louise was strong, beautiful, and very out of place in Victorian England. She had a passion for equalizing education, so that girls could reach the same standards as boys. She was passionate about Women's Rights, and tried to improve the situation of prostitutes in London, much to the horror of her prudish, stuffy mother. She loved the art of sculpture, so she insisted on studying it and became an accomplished sculptor in the days when it was very much a solely masculine occupation. She steadfastly refused to marry a foreigner because she didn't want to leave England, so she married a Scottish lord who was at times her warden and at times her best friend, and all of the time a homosexual. Louise got a motorcar in her 70's and loved racing at top speeds, terrifying all her friends who rode with her. Basically she was a fascinating, badass woman who was powerful and kind, and who was adored by the British public more than anyone else in her family. Of course the scandals that have kept Louise's life whitewashed cannot be proven until her files are released to the public. However, Hawksley presents good evidence to support her theories, and they are groundbreaking. I don't want to give too much away, but between a secret illegitimate child that could pose a threat to the British monarchy and an illicit affair in which her lover died literally during the act of love, I guarantee that any reader will be captivated and spellbound throughout the length of the book. Princess Louise died at 91 years of age, and what a remarkable life she led, what a remarkable person! She was way ahead of her time, and she was loved and adored for it by everyone except her own family. While reading this book I got a sense that Louise provided a bridge between the archaic, distant 1800's and our own modern era, with one foot in each realm, belonging to both and neither of those realms at the same time. At first Louise seemed more historical than real, a shadowy figure in the dusty court of Queen Victoria. But Hawksley's work is so animated and lively that I felt I could reach out and touch Louise, that I could magically understand her. Queen Victoria's Mysterious Daughter is fantastic, addictive, and it made me obsessed with getting to know Louise, looking at every available photo online. Every word and image in Hawksley's book evoked delight and fascination in me, and I envy all those who have yet to read it for the first time. In the days when no one contradicted Queen Victoria and her reign of melancholy grief, Louise remarked that her mother was "not too unwell to open Parliament, simply too unwilling". With those words I fell in love with the amazing, complicated person Louise was, and those feelings only grew throughout this thrilling and artful biography of one of the most interesting Princesses who ever lived.